Hotel Rajdeep is a well situated deluxe hotel in the hill station Ranikhet. The hotel is located centrally in the main market (Sadar Bazaar) of Ranikhet town. With its excellent hospitality and astounding services, this deluxe hotel in Ranikhet attracts family and alone travelers very much. Its one of the well budget hotel in Ranikhet near the bus station. Facing to the Himalayan ranges, the hotel offers undoubtedly incredible views of snow clad mountains. The hotel has many sight seeing places of Ranikhet at a neaby distance. Major places are Chaubatia (10 kms), Bhalu Dam (13 kms), Tarikhet (8 kms), Upat & Kalika Temple (5 kms), Jhoola Devi & Ram Mandir (7 kms), Mankameshwar (0.4 kms), Chilianaulla & Majkhali, Dwarahat, Aashiyana Park, Rani Jhel (Artificial lake), Dunagiri (52 kms), Museum & Art gallery (1 km). 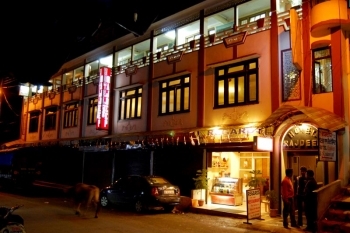 The Rajdeep hotel is located near the Gandhi Chowk on Sadar Bazaar Rd. Roadways bus station is at 5 minutes walking distance from the hotel. 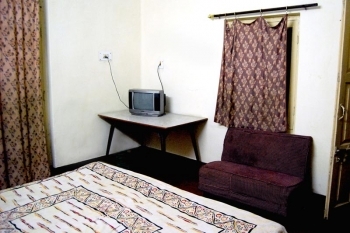 The hotel offers various types of rooms as per need and budget. There are Luxury Family Suites (4 Bedded), Luxury Suites (2 Bedded), Semi Deluxe Family Room (4 Bedded), Semi Deluxe Room (2 Bedded) and Semi Deluxe Triple Bedded Room. Each room has all modern facilities and amenities such as with attached bath, running hot & cold water, TV, telephone and 24 hour power backup. There is a multi cuisine restaurant Regards in Rajdeep hotel serving Indian, Continental, Chinese, German & Spanish food. The Bengali, Gujrati and local Kumauni food cooked in the reataurant is very much popular. - Autumn Season Rates will be applicable during “X-Mas & New Year” Period. Ranikhet is well connected with all major cities by road. Delhi is at a distance of 279 km from Ranikhet. The hotel can reached easily by road, the distance from major town nearby are Nainital is 55 Kms, Kausani is 60 Kms, Mukteshwar is 83 Kms, Almora is 45 Kms, Jim Corbett National Park is 96 Kms only. By Rail - Kathgodam is the nearest Railway Station to Rajdeep hotel in Ranikhet located at a distance of 75 kms. The are many trains from delhi, Lucknow, Kolkata and other places to Kathgodam. By Air - The nearest airport is a Pantnagar Nainital (106 Kms).